The 2005 fieldwork season is now underway at the High Pasture Cave site. The news page will be updated on a regular basis to keep you informed of developments. Therefore, make regular visits to the website and the News Page to find out how work is progressing. Archaeological fieldwork, including excavation, is now underway at the High Pasture Cave site. Work started on the excavation of Trench 2 (surface trench within U-shaped enclosure) on the 1st March. 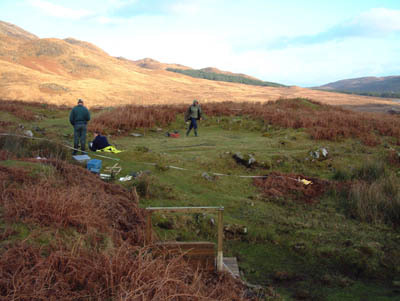 The location of Trench 2 was based on the results of a geophysical survey that was carried out by Stratascan Ltd in December 2004. The survey produced a wide range of data regarding the archaeology hidden below the surface at the site including what may be the original entrance into the cave. This feature is not presently visible on the surface, but it is likely that this is the route by which the prehistoric inhabitants entered Bone Passage, where trial excavations revealed a wide range of archaeological finds in 2004. A detailed report of the geophysical survey will be added to ‘The Work’ section soon. Figure 1. Personnel from Stratascan Ltd carrying out the Ground Penetrating Radar survey within the U-shaped enclosure at High Pastures. Figure 2. 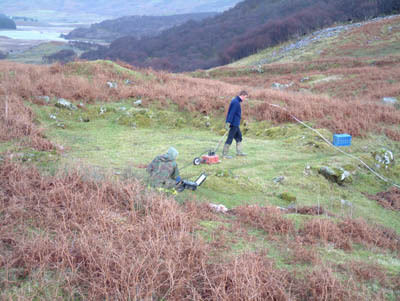 Another view of the Ground Penetrating Radar survey within the U-shaped enclosure at High Pastures. Before we started the excavation of Trench 2, which measures 8m x 4m in extent, we erected a wooden frame over the top of the U-shaped structure to support tarpaulin sheets, so we can keep rain off the excavations (and the people carrying out the work!). Figure 3. The U-shaped enclosure at High Pastures with the wooden frame erected over the top. We started by removing the turf from the trench (a depth of approx. 20cm), which took at least 8 hours to complete (around 350 turf blocks). The soil is a dark, rich brown in colour (forest soil complete with composted bracken material) and is riddled with bracken roots. No modern archaeological material was found during the de-turf stage, but several fire-cracked pebbles and stones were recovered from the base of the turf blocks. More burnt stone could be seen at the inter-face where the turf blocks have been detached. The only other archaeological material recovered from this layer was two fragments of slag deposits, residues from metalworking that must have been taking place somewhere at High Pastures. There is no structure to the walls of the U-shaped enclosure visible at this level – just piles of tumbled stone with no recognisable wall face. Figure 4. Plan of the core structures at High Pastures showing the location of Trench 2 within the U-shaped enclosure. On the 3rd March we continued to excavate through the upper, bracken-infested layers of topsoil. After removing another 15cm of the rich, brown soil, complete with bracken roots, we came down onto a more compacted sediment layer that has a significant amount of fire-cracked stone present. Some small flecks of charcoal were also noticed in this context. As we excavated around the granite cobbles that make-up the ‘wall’ of the U-shaped structure on the east/southeast side of the trench we uncovered a thick layer of fire-cracked stone (with some charcoal flecks), that were banked-up against the granite cobbles of the wall. 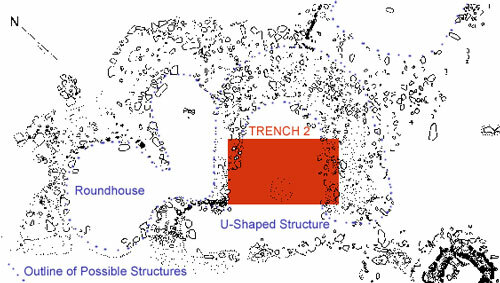 It is possible that the layer of fire-cracked stone may relate to the high response anomalies identified by Stratascan in the geophysical survey results. Figure 5. George and Martin excavating through the tangle of bracken roots in Trench 2.